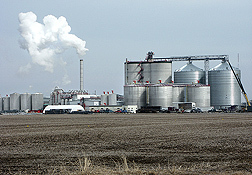 A typical ethanol plant in West Burlington, Iowa (Big River Resources, LLC). Distiller’s dried grains (DDGs) are the leftovers from converting corn into fuel ethanol, a cleaner burning alternative to gasoline. In the Midwest alone, ethanol producers generate 10 million tons of DDGs annually. Farmers buy the stuff for between $85 and $110 a ton and feed it to livestock. Soon, though, growers may be spreading it on their crop fields to cut down on herbicide use. Some DDG extracts may even find health-food uses. Several ARS scientists certainly hope so, since U.S. ethanol production is expected to climb from 4.4 billion gallons annually to 7.5 billion by 2012. That’ll mean even more DDGs and other byproducts. Steven F. Vaughn, a plant physiologist with ARS’s National Center for Agricultural Utilization Research (NCAUR) in Peoria, Illinois, notes that DDGs worked best when incorporated into the soil and left to decompose for a few months. “DDG mulch applied in this manner promoted Kentucky bluegrass growth while inhibiting seed germination of annual bluegrass—which is considered a weed,” he says. Similarly, Vaughn applied DDGs to Roma tomato plots in November 2005, at rates of 1, 2, and 3 kilograms per square meter, and transplanted the crop in early May. At the end of September, the yield was 226 pounds of tomatoes from plots treated with the lowest rate of DDGs and 149 from control plots, which received no DDGs. Nitrogen, phosphorus, and other nutrients from the decomposing mulch probably contributed to much of that yield increase. At the higher DDG rates, however, plants grew large but did not yield as much fruit as the low-DDG plants did. That’s a symptom of too much nitrogen, Vaughn points out. “Weed-seed inhibition is a bit more complicated,” adds Mark A. Berhow, an NCAUR chemist. Using various analytical methods, he’s trying to identify, measure, and monitor the yearly fluctuations of DDG chemicals that may have inhibited germination in crabgrass, chickweed, annual rye, and other weeds studied. ARS has applied for a patent on the mulch and is negotiating terms for the scientists to collaborate with an Illinois-based turfgrass company.—By Jan Suszkiw, Agricultural Research Service Information Staff. "DDGs—Ethanol Byproduct Fights Weeds, Boosts Crop Yields" was published in the May/June 2007 issue of Agricultural Research magazine.